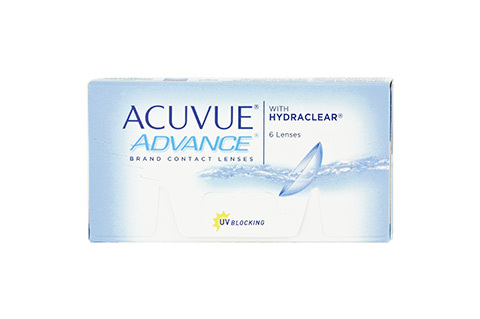 The new ACUVUE Advance with Hydraclear from Johnson & Johnson is a high quality brand lens with UV protection and patented Hydraclear technology. Hydraclear is a new technology that effectively binds moisture in the lenses. The material galyfilcon A and a revolutionary system for preserving moisture ensure maximum comfort, even on long days. The lens hardly absorbs any moisture from the eye, meaning that even dry eyes no longer need to suffer from discomfort with ACUVUE Advance contact lenses. In addition, ACUVUE Advance with Hydraclear lenses have an extraordinarily soft surface, which significantly reduces protein deposits and allows you to wear the lenses for longer (up to 14 hours). The integrated protection from ultraviolet rays protects your eyes from disease later in life. The modern design allows the lens to sit securely on the eye for pin-sharp vision. ACUVUE Advance with Hydraclear features the popular 1-2-3 labelling system, which prevents you from putting the lenses in incorrectly, as well as a handling tint, which makes it easier to use the lenses on a daily basis. ACUVUE Advance with Hydraclear is available in two base curves and for a wide range of spherical values: +8.00D to -12.00D. Plus: Mister Spex delivers the lenses quickly and at a fantastic price. Don't forget to make the most of our bundle offers when ordering several packets of lenses and solutions. Mister Spex advises all online purchasers of ACUVUE Advance contact lenses: the contact lenses, ACUVUE Advance, should always be fitted to your eyes by an eye doctor or optician. The period between fittings, unless otherwise prescribed by an eye doctor or optician, should not exceed 6 months. You should go for regular check-ups. You should also strictly follow the recommended wearing time from the manufacturer Johnson & Johnson/your eye doctor/optician for ACUVUE Advance contact lenses. It is your own personal responsibility to make yourself aware of the care instructions for ACUVUE Advance contact lenses and to follow them accordingly. In case of eye irritation or visual impairments when wearing ACUVUE Advance, consult an eye doctor or optician. Damaged contact lenses should be replaced immediately.